The Zalto Denk'Art Collection is luxury stemware you could sense from your fingertips to the moment you take your first sip. Lead-Free. One (1) glass per order. 9" height, 13 1/2 oz. The Zalto Denk'Art White Wine Glass is recommended for wines full range of white wines. For elegant, classical fruit forward white wines, but also meduim bodied red wines without overt barrique development. From the first touch, each Zalto glass distinguishes itself from all other glasses. From the perfectly executed balance to the extraordinary design, the achievement of the Denk`Art line are glasses that seem nearly too delicate to hold, and yet they are made for just that. This is glassware that stands at the rarefied point where form meets function. This is art. The development of the Denk`Art series was influenced by the earth in accordance to the tilt angles of the Earth. Thus, the curve of the bowls are tilted at the angles of 24 degrees, 48 degrees and 72 degrees. 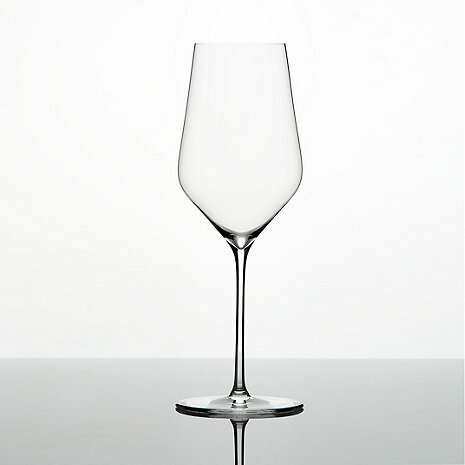 The Zalto Denk'Art White Wine Glass is recommended for wines full range of white wines. For elegant, classical fruit forward white wines, but also meduim bodied red wines without overt barrique development. Especially for: Riesling, Sauvignon Blanc, Muskateller, Frizzante, Sangiovese, St. Laurent and Blaufränkisch. Lead-Free. Dishwasher-Safe. Dimensions: 9" height, 13 1/2 oz. can this glass be personalized? BEST ANSWER: Here at Wine Enthusiast, we customize many of our products. This is a custom order which cannot be placed online. Please call our sales department at 800.356.8466 and they can assist you with this. Thank you. As usual with Zalto, this glass is light and elegant but not as delicate as it looks. It performs admirably with all types of white wine, including chardonnay, concentrating the bouquet and maximizing the palate impact. Highly recommended. We originally had champagne in the champagne Zalto's at a fine retaurant in NYC. The champagne had an unbelievable sensation -- stars exploding in the mouth -hard to describe. I had to recreate the experience! I was able to locate the same wine and found these classes on Wine Enthusiast. What a treat. I mistakingly bought the white wine glasses instead of the flutes -- but will get those later. Great glad, good weight, accents the flavor of the wine in the glass. A well crafted glass, the Zalto Denk'art is one of the best glasses for those wine lovers who want a full-bodied pallette and nose for their white wines. I use this glass when tasting wines and to enjoy the fine wines that I have in my cellar. Great feel with feather weight. Always a pleasure to use. Glasses were a great Christmas present to a white wine enthusiast. The Zalto glasses are unbelievably light weight and delicate. (I'm sure to get feedback on their durability.) One finds oneself automatically correctly holding the glass from the stem & base! The shape of the bowl distinguishes it from other well-known stemware, and remarkably even wine legs are seen as the wine is swirled. Time will tell if the wonderful product is dishwasher safe. Beautiful, elegant, very fine glasses; just the right size, and a lovely shape. Light as a feather. Whether it's 2 Buck Chuck, Chateau Haute Stuff or Your Own Favorite, you will enjoy it more in this true Art Work White Wine stem from Zalto.It doesn't get any better than this! Beautiful glasses. Light, strong, great shape. Do take care when washing by hand. Look great on the table with any of their larger cousins.